For many years researchers have probed the structure of protons—subatomic particles with a positive charge—by bombarding them with electrons and examining the intensity of the scattered electrons at different angles. In this way they have attempted to determine how the proton's electric charge and magnetization are distributed. These experiments had previously led researchers to assume that the electric and magnetic charge distributions are the same, and that one photon—an elementary particle of light—is exchanged when the protons interact with the bombarding electrons. However, in the early 2000s, researchers began to carry out experiments using polarized electron beams, which measure electron-proton elastic scattering using the spin of the protons and electrons. These experiments revealed that the ratio of electric to magnetic charge distributions decreased dramatically with higher-energy interactions between the electrons and protons. This led to the theory that not one but two photons were sometimes being exchanged during the interaction, causing the uneven charge distribution. What's more, the theory predicted that both of these particles would be so-called "hard," or high-energy photons. In a bid to identify this "two-photon exchange," an international team led by researchers in the Laboratory for Nuclear Science at MIT carried out a seven-year experiment, known as OLYMPUS, at the German Electron Synchrotron (DESY) in Hamburg. 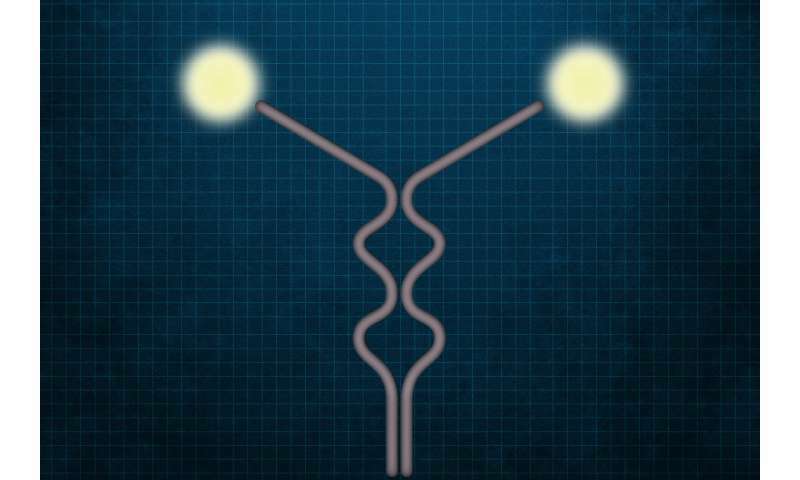 In a paper published this week in the journal Physical Review Letters, the researchers reveal the results of this experiment, which indicate that two photons are indeed exchanged during electron-proton interactions. However, unlike the theoretical predictions, analysis of the OLYMPUS measurements suggests that, most of the time, only one of the photons has high energy, while the other must carry very little energy indeed, according to Richard Milner, a professor of physics and member of the Laboratory for Nuclear Science's Hadronic Physics Group, who led the experiment. "We saw little if no evidence for a hard two-photon exchange," Milner says. Having proposed the idea for the experiment in the late 2000s, the group was awarded funding in 2010. The researchers had to disassemble the former BLAST spectrometer—a complex 125-cubic-meter-sized detector based at MIT—and transport it to Germany, where it was reassembled with some improvements. They then carried out the experiment over three months in 2012, before the particle accelerator at the laboratory was itself decommissioned and shut down at the end of that year. The experiment, which was carried out at the same time as two others in the U.S. and Russia, involved bombarding the protons with both negatively charged electrons and positively charged positrons, and comparing the difference between the two interactions, according to Douglas Hasell, a principal research scientist in the Laboratory for Nuclear Science and the Hadronic Physics Group at MIT, and another of the paper's authors. The process will produce a subtly different measurement depending on whether the protons are scattered by electrons or positrons, Hasell says. "If you see a difference (in the measurements), it would indicate that there is a two-photon effect that is significant." The collisions were run for three months, and the resulting data took a further three years to analyze, Hasell says. The difference between the theoretical and experimental results means further experiments may need to be carried out in the future, at even higher energies where the two-photon exchange effect is expected to be larger, Hasell says. It may prove difficult to achieve the same level of precision reached in the OLYMPUS experiment, however. "We ran the experiment for three months and produced very precise measurements," he says. "You would have to run for years to get the same level of precision, unless the performance (of the experiment) could be improved." In the immediate future, the researchers plan to see how the theoretical physics community responds to the data, before deciding on their next step, Hasell says. "It may be that they can make a small adjustment to a detail within their theoretical models to bring it all into agreement, and explain the data at both higher and lower energies," he says. "Then it will be up to the experimentalists to check if that holds to be the case." The direction vectors of the two photons at maximum energy level would be a fundamental clues. For instance, if they are orthogonal. "For many years researchers have probed the structure of protons—subatomic particles with a positive charge—by bombarding them with electrons and examining the intensity of the scattered electrons at different angles." Do they mean that they change the angles of the electron beams, or measure the angles of the scattered electrons? If there is anomalously different energy transfer rates at one or more angles, that would indicate some new mysteries to be uncovered. ... If there is anomalously different energy transfer rates at one or more angles, that would indicate some new mysteries to be uncovered. Try combining a proton an an electron. Collect these, enough for a volume measure. Note, method of measurement. Essentially, neither the proton or the electron occupy space. We only measure a repulsive/attractive volume, or an inability to measure the field at zero. So good luck trying to measure ghosts. The idea of particles is a false assumption.